Passive cooling approaches are ideal for high reliability systems, like most power electronics applications, because they require no moving parts and little maintenance. Two phase cooling systems have offered these benefits to system designers for decades through capillary-based products like heat pipes. The boiling and condensation process within a two phase system is very effective at moving heat with minimal temperature gradient. However, capillary-based two phase systems are not able to handle the high demands of current power electronics applications. Some gravity-based two phase cooling solutions, like loop thermosyphons, provide a higher performance alternative to current passive cooling solutions. This paper will discuss the recent developments and experimental evaluation of a gravity-driven two phase cooling solution for medium voltage drive applications. Various performance parameters like fluid charge and working fluid were examined to determine their effect on system flow rate, thermal resistance, local heat transfer coefficient, and maximum power capability. A typical LTS consists of an evaporator, a condenser, and plumbing between the two for the liquid and vapor to travel. The liquid return line (or downcomer) is connected to the evaporator cavity to facilitate the flow of the working fluid. In a similar fashion, the vapor line (or riser) is connected to the condenser completing the loop. The system is hermetically sealed and filled with a particular inventory of working fluid. Working fluids are typically dielectric refrigerants with high liquid-to-vapor density ratios and high latent heat. The reason for selecting fluids with these properties is because flow in the loop is driven by the density difference between the downcomer and riser. Larger differences between liquid and vapor states results in a larger driving force and more fluid flow rate. Heat is applied to the loop through the evaporator. The evaporator could take on any number of forms to cool the system in question. The most common configuration for the evaporator is a traditional-looking liquid cold plate in which heat generating components are mounted and the heat is conducted into the system. An example of such a configuration is shown in Figure 2 for a traditional power electronics cooling application. The functionality of an LTS is mostly agnostic to the form of the evaporator, so many variations of an evaporator are possible. In the “off state” the loop sits idle with an equal height of liquid filling the downcomer (h2) and evaporator cavity (h1). As heat is applied to the evaporator region of the loop, vapor bubbles are generated in the flow as the latent heat of the working fluid absorbs the applied energy. These bubbles (or voids) serve to reduce the effective density of the liquid column inside of the evaporator resulting in a net pressure head difference between the downcomer and the evaporator. As more heat is applied to the system, more of the liquid in the evaporator is converted into vapor further reducing the effective density and driving more fluid flow. The maximum amount of fluid flow, and corresponding power input, is determined by the available height difference between the evaporator and condenser (h2-h1). It is useful to define a term, void ratio, to refer to the ratio of void space in the evaporator to the volume still occupied by liquid. As more heat is applied to the LTS, the void ratio approaches 1 (or 100%). At this point the maximum height gradient between the condenser and evaporator is achieved because there is no more liquid head inside of the evaporator (i.e. h1 = 0). As shown in Figure 3, this point near maximum void fraction is not necessarily a point of dryout (or maximum vapor quality) like would be seen in other passive two phase systems. Since void fraction is a density-driven term, fluids with low vapor densities and relatively high latent heat will reach a state near maximum voiding before all of the latent heat is consumed (i.e. quality = 1). In practical terms what this means is that an LTS will always operate in an excess liquid flow regime. As shown in Figure 3, the flow rate around the loop could approach its maximum level at a vapor quality of around 0.5. In contrast, heat pipes operate in a binary boiling and condensation process where the evaporator sends 100% quality vapor to the condenser and only saturated liquid (i.e. quality = 0) is returned to the evaporator. In this case the maximum power that a heat pipe can carry is directly proportional to the latent heat of the working fluid. Since excess liquid is virtually guaranteed in an LTS, the maximum power handing capability can far exceed that of a heat pipe provided that sufficient vertical height is available. The intention of this work is to explore the performance limitations of a loop thermosyphon solution in a power electronics application. The following sections describe the experimental apparatus used to evaluate the effect working fluid and power input have on several performance metrics. A prototype loop thermosyphon and testing apparatus was developed to investigate the effect of various design parameters on the performance of the system. Figure 4 illustrates the testing apparatus that was used during the study. An evaporator assembly was fabricated from aluminum and instrumented with a turbine flowmeter, temperature and pressure sensors. The evaporator was attached to a standard copper tube and aluminum fin condenser which was instrumented with a pressure and temperature sensor as well. Three copper heating blocks were used to simulate power electronics modules and the heaters were instrumented with three temperature sensors, as shown in Figure 5. Finally a fan was installed and controlled with an external power supply. The air temperature was also monitored by a temperature probe located at the condenser inlet. Figure 5. An illustration indicating the locations of heater temperature measurements. The total power into the system ranged from 0 to 6000W for this study. 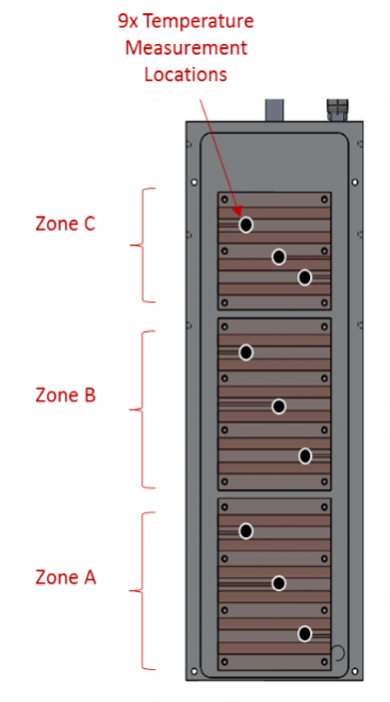 The power was split evenly between the heaters in Zone A and Zone B but reduced in Zone C to match the heat flux of Zones A and B. The heat source for Zone A and Zone B was 190mm x 140mm and the heat source for Zone C was 130mm x 140mm. The flow direction of the refrigerant during normal operation is from Zone A towards Zone C.
Two different working fluids were examined; R134a and R245fa. R134a is a standard refrigerant used in the automotive and HVAC industries and exhibits a relatively high vapor pressure relative to R245fa. R245fa has a higher latent heat, higher liquid density, and a lower vapor density across the entire temperature range of these fluids. Various fluid inventories were also examined for both fluids, but the results of just the optimal fluid charge are shared here. Thermal resistance, for the purposes of this work, was determined by subtracting the ambient air temperature from the maximum heat source temperature from all of the zones and dividing it by the total power input, as defined by Eq. 1. The heat transfer coefficient was estimated locally at each zone by utilizing the local heater block temperature and subtracting off the conduction resistances to the evaporator internal surface. The temperature sensors were located on evaporator external surface so conduction through the thermal interface material and aluminum block were subtracted to obtain the internal surface temperature for convection. The heat transfer coefficient could then be determined by Eq. 2. Liquid flow rate is an important factor in determining the performance of any LTS because it has a major impact on how much heat can be dissipated. 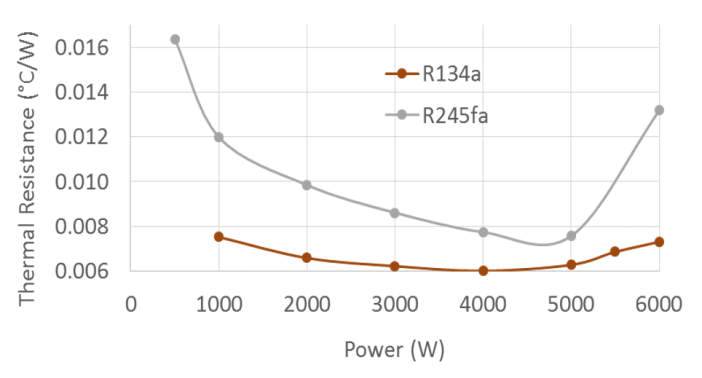 Figure 6 shows the fluid flow rate for both R134a and R245fa as a function of power into the evaporator. It can be seen that both fluids exhibit an asymptotic trend of fluid flow with increasing power. This is to be expected from a loop thermosyphon. As detailed in a previous section, fluid flow in an LTS is determined by the density difference between the downcomer and the riser. As more heat is applied to the evaporator the amount of vapor generated increases. The more vapor present in the evaporator the higher the void fraction becomes and the larger the density difference between the liquid column and the evaporator becomes. The trend is asymptotic because there is a point where riser becomes mostly vapor (by volume) and the density difference is maximized. The flow rate is maximized at this point and is maintained as long as the density difference is present. 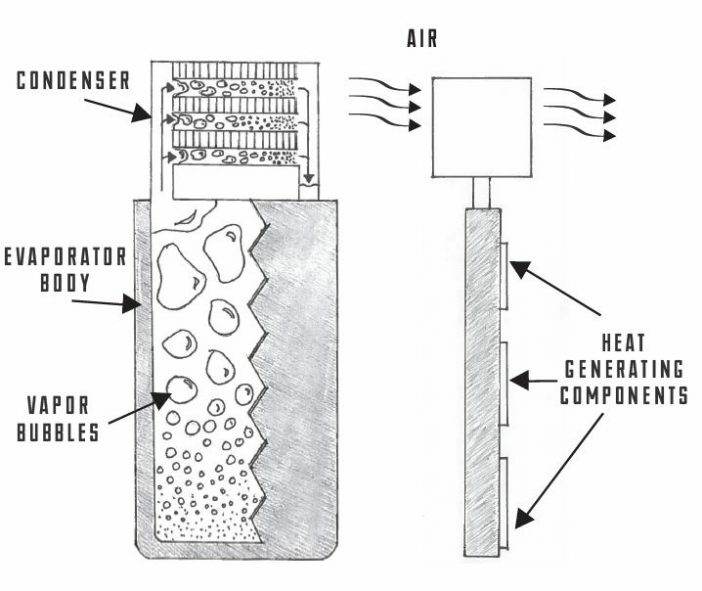 As the flow rate levels off and the power is increased further, the vapor quality within the evaporator approaches and exceeds 1 as shown in Figure 7. It’s worth noting that values greater than 1 on this chart simply indicate superheated vapor and are no longer valid data points in the context of vapor quality. Inspection of Figure 6 and Figure 7 together shows that the maximum flow rate for both fluids is achieved before the vapor quality reaches a value 1. This is evidence that there is in fact excess fluid flowing through the evaporator and the heat transfer mechanism can be characterized as a flow boiling environment. Flow boiling is known to be more effective than pool boiling because of the turbulent nature of the two phase mixture flowing across the heated surface. This phenomenon makes loop thermosyphons more effective cooling devices than traditional thermosyphons or heat pipes. It can also be seen that R134a exhibits a higher maximum flow rate than R245fa despite having thermophysical properties that would suggest an inferior fluid. As mentioned earlier, R245fa has a higher latent heat, high liquid density and a lower vapor density. A higher liquid to vapor density ratio would result in a larger possible net density difference to drive the flow. However, in the context of two phase flow a lower vapor density results in significantly higher vapor velocities and higher pressure drop in the evaporator. The increased pressure drop experienced with R245fa hinders the maximum flow rate achievable in a gravity-driven system like a loop thermosyphon. This result would indicate that a system developed for use with R245fa would need larger flow passages to account for the potentially higher pressure drop in order to perform similarly to an equivalent system with R134a. 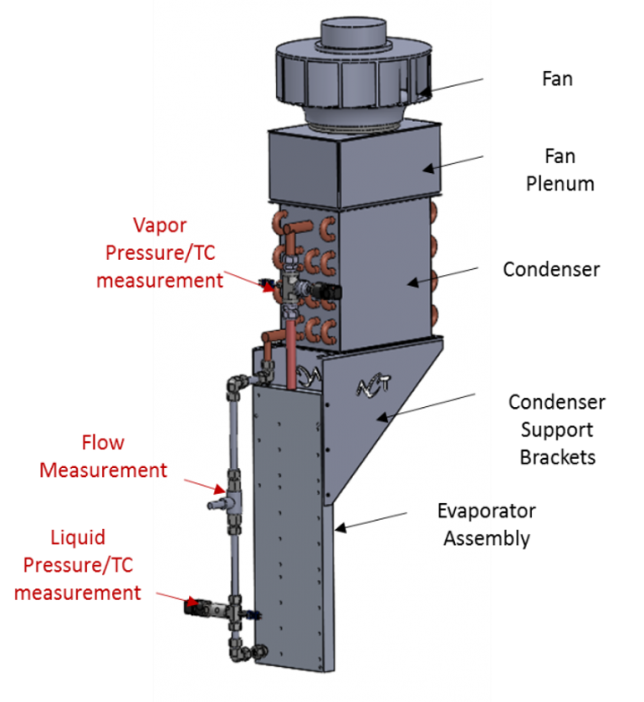 In a flow boiling environment the convective heat transfer coefficient is largely dependent on fluid flow rate and the vapor quality of the fluid flowing across the surface. Figure 8 shows the local heat transfer coefficient for the various heating zones on the evaporator as a function of the input power. There are several important trends that can be observed. First, the heat transfer coefficient peaks at a certain power at all locations and for both fluids. This is the result of the two phase heat transfer coefficient’s dependency on vapor quality. As the power increases the vapor quality increases, as shown in Figure 7. In two phase flow a higher quality results in more turbulence of the liquid/vapor mixture and higher heat removal. This phenomenon has a limit as the vapor quality approaches 1 because the available liquid for cooling starts to decrease. At very high vapor qualities there is no longer enough liquid to effectively absorb heat and the heat transfer coefficient begins to decrease until dryout occurs. This is consistent with the trend that is displayed in Figure 8. Another trend that can be observed is that the heat transfer coefficient is the highest in Zone B which is in the middle of the flow path. This trend can again be explained by the relationship between two phase heat transfer coefficient and vapor quality. At Zone A, the flow is most likely sub-cooled or barely boiling which would result in a lower heat transfer coefficient. As the flow picks up more heat in Zone B the vapor quality increases to a more efficient level and the highest heat transfer coefficients are achieved. By the time the flow reaches Zone C, most of the latent heat has been absorbed and the vapor quality is relatively high. This results in a reduction in heat transfer coefficient. Finally, it is clear that R134a results in higher heat transfer coefficients than R245fa across the board. This is not a surprising result given the reduced flow rate that is seen with R245fa in this system and the resulting higher vapor qualities. 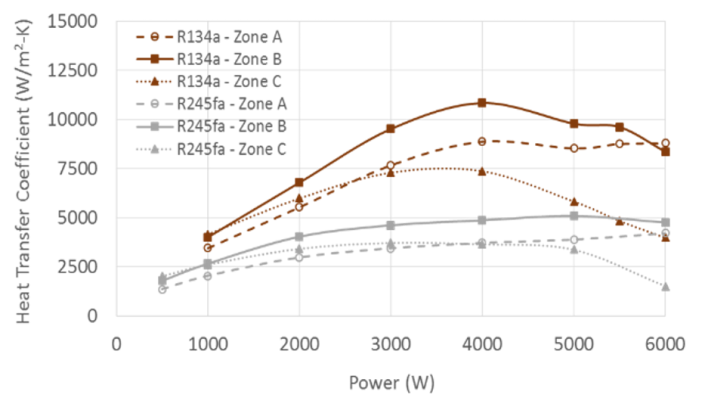 Figure 9 depicts the overall thermal resistance of the system as a function of input power. It can be seen that an optimal power exists in which the thermal resistance is minimized for both fluids. Inspection again of Figure 8 shows that the minimum thermal resistance is achieved at the point of maximum evaporator heat transfer coefficient. The thermal resistance increases significantly past this point as the system approaches dryout. For R245fa this point of increase in thermal resistance occurs quickly due to the high vapor qualities that are observed above 4000W. 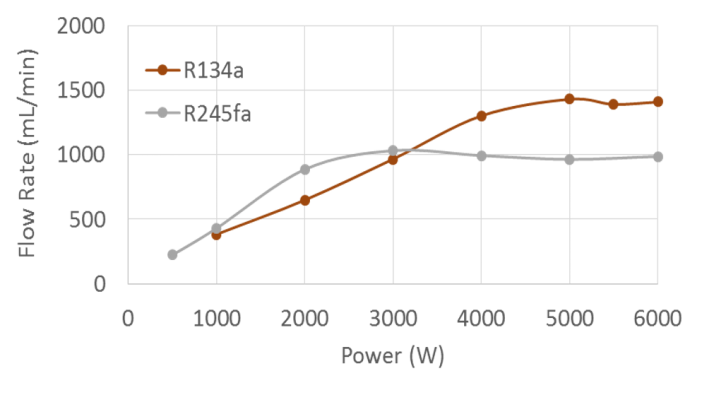 R134a displays a slower increase in the range of powers tested here but if the power were increased further the thermal resistance curve would increase sharply until dryout as seen with R245fa. This experiment has demonstrated the ability of a passive, gravity-driven two phase device to dissipate power levels typical of a power electronics application. 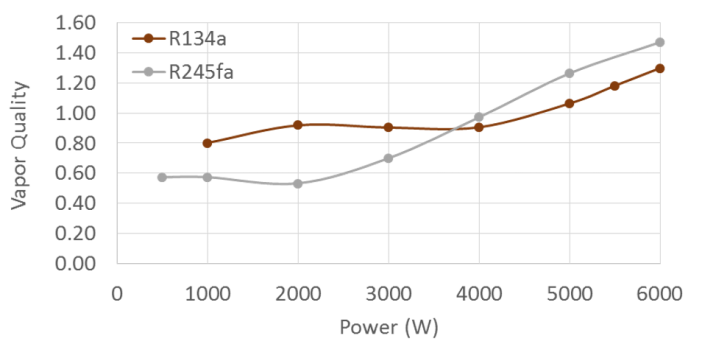 A comparison between R134a and R245fa showed that with the given system design R134a performed more favorably. The author accepts that a system designed with larger flow passages may suit R245fa better. It was also confirmed that loop thermosyphons operate with excess fluid allowing for higher heat transfer coefficients and more power handling capability. Loop thermosyphons present a very attractive alternative to heat pipe or actively cooled power electronics. They exhibit high performance across a wide range of power inputs and they operate passively. As long as the system allows for a vertical operating orientation, loop thermosyphons could be the solution of the future.